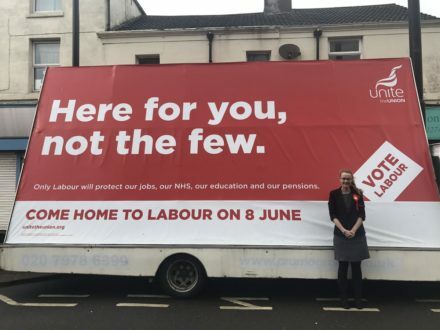 Cat Smith has one of the most marginal seats held by a supporter of Jeremy Corbyn’s leadership. Lancaster and Fleetwood is described by activists as a microcosm of Britain and the two towns are pretty different – and divided by that most divisive topic of all, Brexit. Whilst the prosperous university town of Lancaster backed Remain in the EU referendum, poorer Fleetwood strongly voted for Leave. The constituency as a whole almost exactly mirrored the Britain wide result – 52:48. Fleetwood is detached too from the other half of the constituency, on a spit of land jutting out from the west of England. The lack of good transport links dominates doorstep conversations here and Smith hopes that Corbyn’s pledge to invest in neglected areas like this will cut through. A rail link would be transformative in a town where you can’t even do an A-level – the local secondary school only takes pupils up to 16 – and children have to travel to Blackpool, further down the Fylde coast. Smith’s majority in 2015 was just 1,256, and UKIP received 4,060 votes. Once again, the kippers are not standing here this time around. The regressive alliance strikes again, and the concern is here – as it is across far too many Labour held seats in the country – that it could allow the Tories back in, to a seat they hold from 2010-15. The former MP Eric Ollerenshaw is standing as the Conservative candidate, and the name recognition he will have as a result will, unfortunately, help him. He has not, however, pledged to open an office in the constituency itself, and he did not when he was the MP, in stark contrast to Smith. She has an office on the main street in Fleetwood which is open to any who need her assistance. This is in addition to an office in Lancaster and her desire to be an accessible public servant is recognised by the voters. Following Smith on visits across Fleetwood, we talk to a young mother, who is concerned about provision for her child with autism and learning difficulties. Whilst this mother is likely to be a non-voter, and pretty disengaged with politics, she has heard of Cat and the work that she has done for many in the community. She says that Cat is not what she’d expected as the MP. This mum is entirely right – Smith isn’t what the average Briton might expect of a politician, she’s young, dynamic, and – crucially – she’s a she. Unfortunately she also has a real fight on her hands to keep her seat and, while there are important questions to be asked about why it is that women tend to be in marginal seats with bigger fights to retain them, for the moment there is only one point to consider. To keep a champion of social justice, reproductive rights and women’s representation, who works hard for her all her constituents in parliament, she’ll need the help of Labour activists.